What the hell is a Shabu Shabu?!?! It's actually NOT a German dog, but a kind of Japanese dining experience where you cook thinly sliced meat in a hot pot on the table in front of you! 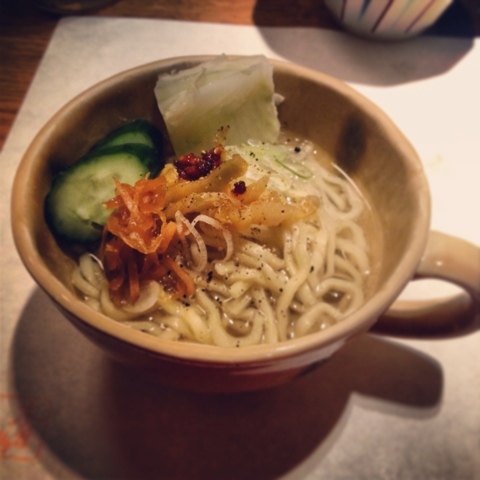 We found a place in Tokyo called Kisoji, located in Shinjuku. The women were dressed in traditional kimonos and were painfully polite. Our waitress could tell that we were first-timers, and tried to guide our round eyes through the process. We pointed to the pretty pictures on the menu that looked like ribbons of delicious marbled beef, and it appeared just like that on a plate at our table. 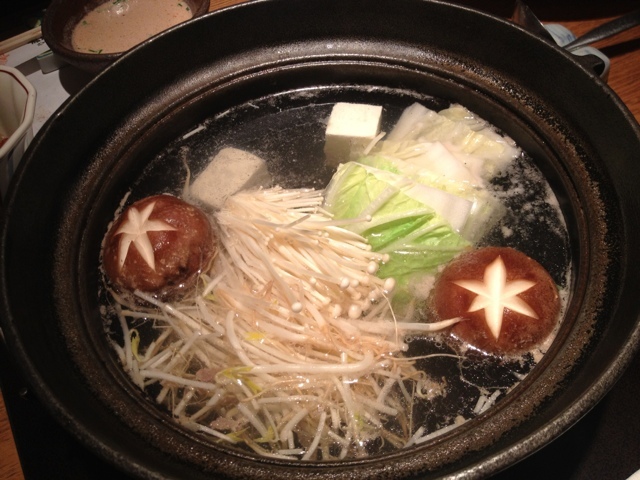 The hot pot of water was boiling with vegetables inside. Our waitress showed us how to cook the beef by giving each slice a quick swirl in the pot for a very rare result. The meat was insanely good, it melted in my mouth. We were given two dipping sauces. One was a type of soy sauce mixture, and the other was a sesame sauce. The sesame sauce was rich and DIVINE. However, it got old fast after a few heavy dunks. The rest of the vegetables, tofu, and glass noodles were tossed in after our sweet waitress skimmed the pot for floating fat residue polluting the water. 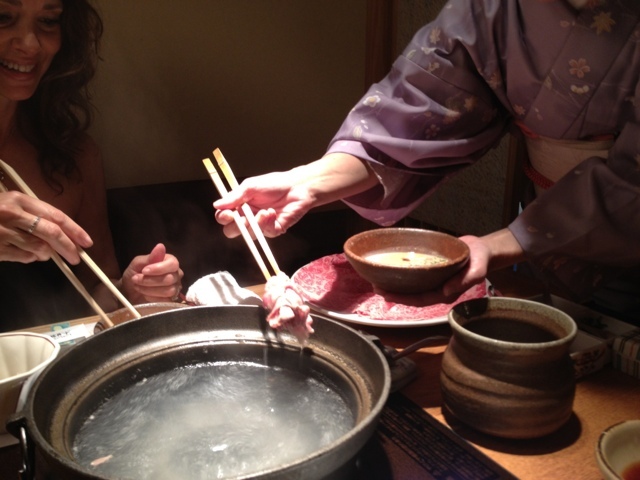 Presentation is very important in Japan, and even your hot pot should look pretty. Finally, she empties the leftover vegetables and uses the broth to cook ramen noodles. When cooked, she prepares us each a teacup filled with ramen and leaves us to garnish it with hot pepper oil, ginger shavings, and cucumber. By this point I was blacking out into a genuine food coma. But first, dessert. I'm still learning to appreciate Japanese desserts for what they are: gelatinous, bland, etc. (Just my silly American opinion). 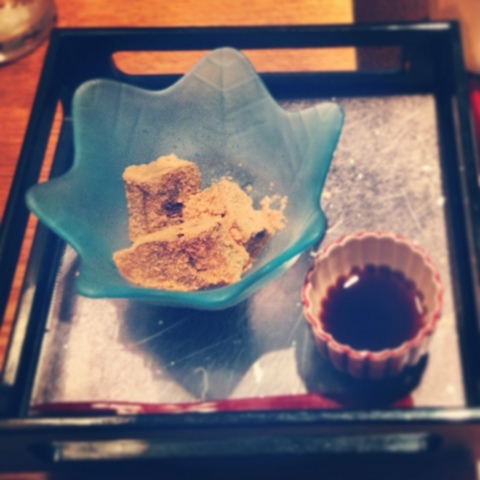 HOWEVER, the mochi with sesame powder and syrup was insane. The best. I washed the whole meal down with a glass of green tea to trick myself into thinking at least something I consumed was relatively healthy today. 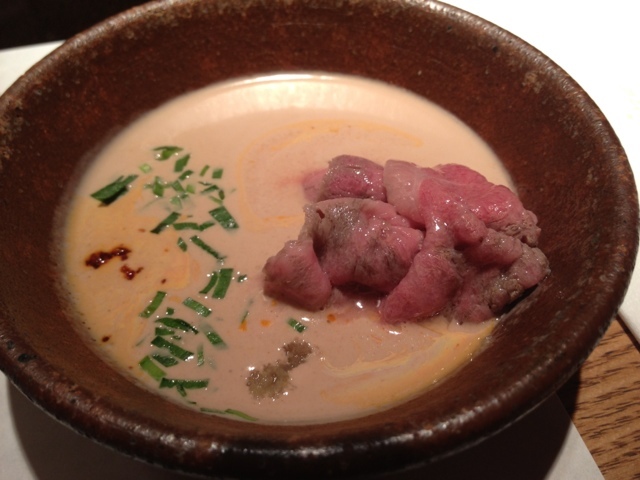 If you go to Tokyo, PLEASE, for me, have dinner at Kisoji.